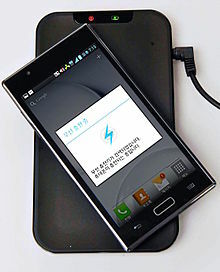 Inductive charging pad for LG smartphone, using the Qi system, an example of near-field wireless transfer. When the phone is set on the pad, a coil in the pad creates a magnetic field which induces a current in another coil, in the phone, charging its battery. Wireless power transfer (WPT), wireless power transmission, wireless energy transmission (WET), or electromagnetic power transfer is the transmission of electrical energy without wires as a physical link. In a wireless power transmission system, a transmitter device, driven by electric power from a power source, generates a time-varying electromagnetic field, which transmits power across space to a receiver device, which extracts power from the field and supplies it to an electrical load. The technology of the wireless power transmission can eliminate the use of the wires and batteries, thus increasing the mobility, convenience, and safety of an electronic device for all users. Wireless power transfer is useful to power electrical devices where interconnecting wires are inconvenient, hazardous, or are not possible. In far-field or radiative techniques, also called power beaming, power is transferred by beams of electromagnetic radiation, like microwaves or laser beams. These techniques can transport energy longer distances but must be aimed at the receiver. Proposed applications for this type are solar power satellites, and wireless powered drone aircraft. An important issue associated with all wireless power systems is limiting the exposure of people and other living things to potentially injurious electromagnetic fields. Wireless power transfer is a generic term for a number of different technologies for transmitting energy by means of electromagnetic fields. The technologies, listed in the table below, differ in the distance over which they can transfer power efficiently, whether the transmitter must be aimed (directed) at the receiver, and in the type of electromagnetic energy they use: time varying electric fields, magnetic fields, radio waves, microwaves, infrared or visible light waves. In general a wireless power system consists of a "transmitter" device connected to a source of power such as a mains power line, which converts the power to a time-varying electromagnetic field, and one or more "receiver" devices which receive the power and convert it back to DC or AC electric current which is used by an electrical load. At the transmitter the input power is converted to an oscillating electromagnetic field by some type of "antenna" device. The word "antenna" is used loosely here; it may be a coil of wire which generates a magnetic field, a metal plate which generates an electric field, an antenna which radiates radio waves, or a laser which generates light. A similar antenna or coupling device at the receiver converts the oscillating fields to an electric current. An important parameter that determines the type of waves is the frequency, which determines the wavelength. Wireless power uses the same fields and waves as wireless communication devices like radio, another familiar technology that involves electrical energy transmitted without wires by electromagnetic fields, used in cellphones, radio and television broadcasting, and WiFi. In radio communication the goal is the transmission of information, so the amount of power reaching the receiver is not so important, as long as it is sufficient that the information can be received intelligibly. In wireless communication technologies only tiny amounts of power reach the receiver. In contrast, with wireless power transfer the amount of energy received is the important thing, so the efficiency (fraction of transmitted energy that is received) is the more significant parameter. For this reason, wireless power technologies are likely to be more limited by distance than wireless communication technologies. Inductive coupling Short Low Hz – MHz Wire coils Electric tooth brush and razor battery charging, induction stovetops and industrial heaters. Resonant inductive coupling Mid- Low kHz – GHz Tuned wire coils, lumped element resonators Charging portable devices (Qi), biomedical implants, electric vehicles, powering buses, trains, MAGLEV, RFID, smartcards. Capacitive coupling Short Low kHz – MHz Metal plate electrodes Charging portable devices, power routing in large-scale integrated circuits, Smartcards, biomedical implants. Magnetodynamic coupling Short N.A. Hz Rotating magnets Charging electric vehicles, biomedical implants. Light waves Long High ≥THz Lasers, photocells, lenses Charging portable devices, powering drone aircraft, powering space elevator climbers. Electric and magnetic fields are created by charged particles in matter such as electrons. A stationary charge creates an electrostatic field in the space around it. A steady current of charges (direct current, DC) creates a static magnetic field around it. The above fields contain energy, but cannot carry power because they are static. However time-varying fields can carry power. Accelerating electric charges, such as are found in an alternating current (AC) of electrons in a wire, create time-varying electric and magnetic fields in the space around them. These fields can exert oscillating forces on the electrons in a receiving "antenna", causing them to move back and forth. These represent alternating current which can be used to power a load. Near-field or nonradiative region – This means the area within about 1 wavelength (λ) of the antenna. In this region the oscillating electric and magnetic fields are separate and power can be transferred via electric fields by capacitive coupling (electrostatic induction) between metal electrodes, or via magnetic fields by inductive coupling (electromagnetic induction) between coils of wire. These fields are not radiative, meaning the energy stays within a short distance of the transmitter. If there is no receiving device or absorbing material within their limited range to "couple" to, no power leaves the transmitter. The range of these fields is short, and depends on the size and shape of the "antenna" devices, which are usually coils of wire. The fields, and thus the power transmitted, decrease exponentially with distance, so if the distance between the two "antennas" Drange is much larger than the diameter of the "antennas" Dant very little power will be received. Therefore, these techniques cannot be used for long range power transmission. Short range – up to about one antenna diameter: Drange ≤ Dant. This is the range over which ordinary nonresonant capacitive or inductive coupling can transfer practical amounts of power. Mid-range – up to 10 times the antenna diameter: Drange ≤ 10 Dant. This is the range over which resonant capacitive or inductive coupling can transfer practical amounts of power. Far-field or radiative region – Beyond about 1 wavelength (λ) of the antenna, the electric and magnetic fields are perpendicular to each other and propagate as an electromagnetic wave; examples are radio waves, microwaves, or light waves. This part of the energy is radiative, meaning it leaves the antenna whether or not there is a receiver to absorb it. The portion of energy which does not strike the receiving antenna is dissipated and lost to the system. The amount of power emitted as electromagnetic waves by an antenna depends on the ratio of the antenna's size Dant to the wavelength of the waves λ, which is determined by the frequency: λ = c/f. At low frequencies f where the antenna is much smaller than the size of the waves, Dant << λ, very little power is radiated. Therefore the near-field devices above, which use lower frequencies, radiate almost none of their energy as electromagnetic radiation. Antennas about the same size as the wavelength Dant ≈ λ such as monopole or dipole antennas, radiate power efficiently, but the electromagnetic waves are radiated in all directions (omnidirectionally), so if the receiving antenna is far away, only a small amount of the radiation will hit it. Therefore, these can be used for short range, inefficient power transmission but not for long range transmission. However, unlike fields, electromagnetic radiation can be focused by reflection or refraction into beams. By using a high-gain antenna or optical system which concentrates the radiation into a narrow beam aimed at the receiver, it can be used for long range power transmission. From the Rayleigh criterion, to produce the narrow beams necessary to focus a significant amount of the energy on a distant receiver, an antenna must be much larger than the wavelength of the waves used: Dant >> λ = c/f. Practical beam power devices require wavelengths in the centimeter region or below, corresponding to frequencies above 1 GHz, in the microwave range or above. At large relative distance, the near-field components of electric and magnetic fields are approximately quasi-static oscillating dipole fields. These fields decrease with the cube of distance: (Drange/Dant)−3 Since power is proportional to the square of the field strength, the power transferred decreases as (Drange/Dant)−6. or 60 dB per decade. In other words, if far apart, doubling the distance between the two antennas causes the power received to decrease by a factor of 26 = 64. As a result, inductive and capacitive coupling can only be used for short-range power transfer, within a few times the diameter of the antenna device Dant. Unlike in a radiative system where the maximum radiation occurs when the dipole antennas are oriented transverse to the direction of propagation, with dipole fields the maximum coupling occurs when the dipoles are oriented longitudinally. (left) Modern inductive power transfer, an electric toothbrush charger. A coil in the stand produces a magnetic field, inducing an alternating current in a coil in the toothbrush, which is rectified to charge the batteries. (right) A light bulb powered wirelessly by induction, in 1910. In inductive coupling (electromagnetic induction or inductive power transfer, IPT), power is transferred between coils of wire by a magnetic field. The transmitter and receiver coils together form a transformer (see diagram). An alternating current (AC) through the transmitter coil (L1) creates an oscillating magnetic field (B) by Ampere's law. The magnetic field passes through the receiving coil (L2), where it induces an alternating EMF (voltage) by Faraday's law of induction, which creates an alternating current in the receiver. The induced alternating current may either drive the load directly, or be rectified to direct current (DC) by a rectifier in the receiver, which drives the load. A few systems, such as electric toothbrush charging stands, work at 50/60 Hz so AC mains current is applied directly to the transmitter coil, but in most systems an electronic oscillator generates a higher frequency AC current which drives the coil, because transmission efficiency improves with frequency. Inductive coupling is the oldest and most widely used wireless power technology, and virtually the only one so far which is used in commercial products. It is used in inductive charging stands for cordless appliances used in wet environments such as electric toothbrushes and shavers, to reduce the risk of electric shock. Another application area is "transcutaneous" recharging of biomedical prosthetic devices implanted in the human body, such as cardiac pacemakers and insulin pumps, to avoid having wires passing through the skin. It is also used to charge electric vehicles such as cars and to either charge or power transit vehicles like buses and trains. However the fastest growing use is wireless charging pads to recharge mobile and handheld wireless devices such as laptop and tablet computers, cellphones, digital media players, and video game controllers. , usually within centimeters, with the coils' axes aligned. Wide, flat coil shapes are usually used, to increase coupling. Ferrite "flux confinement" cores can confine the magnetic fields, improving coupling and reducing interference to nearby electronics, but they are heavy and bulky so small wireless devices often use air-core coils. Ordinary inductive coupling can only achieve high efficiency when the coils are very close together, usually adjacent. In most modern inductive systems resonant inductive coupling (described below) is used, in which the efficiency is increased by using resonant circuits. This can achieve high efficiencies at greater distances than nonresonant inductive coupling. Powermat inductive charging spots in a coffee shop. Customers can set their phones and computers on them to recharge. Resonant inductive coupling (electrodynamic coupling, strongly coupled magnetic resonance) is a form of inductive coupling in which power is transferred by magnetic fields (B, green) between two resonant circuits (tuned circuits), one in the transmitter and one in the receiver (see diagram, right). Each resonant circuit consists of a coil of wire connected to a capacitor, or a self-resonant coil or other resonator with internal capacitance. The two are tuned to resonate at the same resonant frequency. The resonance between the coils can greatly increase coupling and power transfer, analogously to the way a vibrating tuning fork can induce sympathetic vibration in a distant fork tuned to the same pitch. Nikola Tesla first discovered resonant coupling during his pioneering experiments in wireless power transfer around the turn of the 20th century, but the possibilities of using resonant coupling to increase transmission range has only recently been explored. In 2007 a team led by Marin Soljačić at MIT used two coupled tuned circuits each made of a 25 cm self-resonant coil of wire at 10 MHz to achieve the transmission of 60 W of power over a distance of 2 meters (6.6 ft) (8 times the coil diameter) at around 40% efficiency. The concept behind resonant inductive coupling systems is that high Q factor resonators exchange energy at a much higher rate than they lose energy due to internal damping. Therefore, by using resonance, the same amount of power can be transferred at greater distances, using the much weaker magnetic fields out in the peripheral regions ("tails") of the near fields. Resonant inductive coupling can achieve high efficiency at ranges of 4 to 10 times the coil diameter (Dant). This is called "mid-range" transfer, in contrast to the "short range" of nonresonant inductive transfer, which can achieve similar efficiencies only when the coils are adjacent. Another advantage is that resonant circuits interact with each other so much more strongly than they do with nonresonant objects that power losses due to absorption in stray nearby objects are negligible. A drawback of resonant coupling theory is that at close ranges when the two resonant circuits are tightly coupled, the resonant frequency of the system is no longer constant but "splits" into two resonant peaks, so the maximum power transfer no longer occurs at the original resonant frequency and the oscillator frequency must be tuned to the new resonance peak. Resonant technology is currently being widely incorporated in modern inductive wireless power systems. One of the possibilities envisioned for this technology is area wireless power coverage. A coil in the wall or ceiling of a room might be able to wirelessly power lights and mobile devices anywhere in the room, with reasonable efficiency. An environmental and economic benefit of wirelessly powering small devices such as clocks, radios, music players and remote controls is that it could drastically reduce the 6 billion batteries disposed of each year, a large source of toxic waste and groundwater contamination. Capacitive coupling also referred to as electric coupling, makes use of electric fields for the transmission of power between two electrodes (an anode and cathode) forming a capacitance for the transfer of power. In capacitive coupling (electrostatic induction), the conjugate of inductive coupling, energy is transmitted by electric fields between electrodes such as metal plates. The transmitter and receiver electrodes form a capacitor, with the intervening space as the dielectric. An alternating voltage generated by the transmitter is applied to the transmitting plate, and the oscillating electric field induces an alternating potential on the receiver plate by electrostatic induction, which causes an alternating current to flow in the load circuit. The amount of power transferred increases with the frequency the square of the voltage, and the capacitance between the plates, which is proportional to the area of the smaller plate and (for short distances) inversely proportional to the separation. Capacitive coupling has only been used practically in a few low power applications, because the very high voltages on the electrodes required to transmit significant power can be hazardous, and can cause unpleasant side effects such as noxious ozone production. In addition, in contrast to magnetic fields, electric fields interact strongly with most materials, including the human body, due to dielectric polarization. Intervening materials between or near the electrodes can absorb the energy, in the case of humans possibly causing excessive electromagnetic field exposure. However capacitive coupling has a few advantages over inductive coupling. The field is largely confined between the capacitor plates, reducing interference, which in inductive coupling requires heavy ferrite "flux confinement" cores. Also, alignment requirements between the transmitter and receiver are less critical. Capacitive coupling has recently been applied to charging battery powered portable devices as well as charging or continuous wireless power transfer in biomedical implants, and is being considered as a means of transferring power between substrate layers in integrated circuits. Transverse design: In this type of circuit, there are two transmitter plates and two receiver plates. Each transmitter plate is coupled to a receiver plate. The transmitter oscillator drives the transmitter plates in opposite phase (180° phase difference) by a high alternating voltage, and the load is connected between the two receiver plates. The alternating electric fields induce opposite phase alternating potentials in the receiver plates, and this "push-pull" action causes current to flow back and forth between the plates through the load. A disadvantage of this configuration for wireless charging is that the two plates in the receiving device must be aligned face to face with the charger plates for the device to work. Longitudinal design: In this type of circuit, the transmitter and receiver have only one active electrode, and either the ground or a large passive electrode serves as the return path for the current. The transmitter oscillator is connected between an active and a passive electrode. The load is also connected between an active and a passive electrode. The electric field produced by the transmitter induces alternating charge displacement in the load dipole through electrostatic induction. Resonance can also be used with capacitive coupling to extend the range. At the turn of the 20th century, Nikola Tesla did the first experiments with both resonant inductive and capacitive coupling. In this method, power is transmitted between two rotating armatures, one in the transmitter and one in the receiver, which rotate synchronously, coupled together by a magnetic field generated by permanent magnets on the armatures. The transmitter armature is turned either by or as the rotor of an electric motor, and its magnetic field exerts torque on the receiver armature, turning it. The magnetic field acts like a mechanical coupling between the armatures. The receiver armature produces power to drive the load, either by turning a separate electric generator or by using the receiver armature itself as the rotor in a generator. This device has been proposed as an alternative to inductive power transfer for noncontact charging of electric vehicles. A rotating armature embedded in a garage floor or curb would turn a receiver armature in the underside of the vehicle to charge its batteries. It is claimed that this technique can transfer power over distances of 10 to 15 cm (4 to 6 inches) with high efficiency, over 90%. Also, the low frequency stray magnetic fields produced by the rotating magnets produce less electromagnetic interference to nearby electronic devices than the high frequency magnetic fields produced by inductive coupling systems. A prototype system charging electric vehicles has been in operation at University of British Columbia since 2012. Other researchers, however, claim that the two energy conversions (electrical to mechanical to electrical again) make the system less efficient than electrical systems like inductive coupling. Far field methods achieve longer ranges, often multiple kilometer ranges, where the distance is much greater than the diameter of the device(s). High-directivity antennas or well-collimated laser light produce a beam of energy that can be made to match the shape of the receiving area. The maximum directivity for antennas is physically limited by diffraction. In general, visible light (from lasers) and microwaves (from purpose-designed antennas) are the forms of electromagnetic radiation best suited to energy transfer. The dimensions of the components may be dictated by the distance from transmitter to receiver, the wavelength and the Rayleigh criterion or diffraction limit, used in standard radio frequency antenna design, which also applies to lasers. Airy's diffraction limit is also frequently used to determine an approximate spot size at an arbitrary distance from the aperture. Electromagnetic radiation experiences less diffraction at shorter wavelengths (higher frequencies); so, for example, a blue laser is diffracted less than a red one. The Rayleigh criterion dictates that any radio wave, microwave or laser beam will spread and become weaker and diffuse over distance; the larger the transmitter antenna or laser aperture compared to the wavelength of radiation, the tighter the beam and the less it will spread as a function of distance (and vice versa). Smaller antennae also suffer from excessive losses due to side lobes. However, the concept of laser aperture considerably differs from an antenna. Typically, a laser aperture much larger than the wavelength induces multi-moded radiation and mostly collimators are used before emitted radiation couples into a fiber or into space. Ultimately, beamwidth is physically determined by diffraction due to the dish size in relation to the wavelength of the electromagnetic radiation used to make the beam. Microwave power beaming can be more efficient than lasers, and is less prone to atmospheric attenuation caused by dust or water vapor. Here, the power levels are calculated by combining the above parameters together, and adding in the gains and losses due to the antenna characteristics and the transparency and dispersion of the medium through which the radiation passes. That process is known as calculating a link budget. An artist's depiction of a solar satellite that could send electric energy by microwaves to a space vessel or planetary surface. Power transmission via radio waves can be made more directional, allowing longer-distance power beaming, with shorter wavelengths of electromagnetic radiation, typically in the microwave range. A rectenna may be used to convert the microwave energy back into electricity. Rectenna conversion efficiencies exceeding 95% have been realized. Power beaming using microwaves has been proposed for the transmission of energy from orbiting solar power satellites to Earth and the beaming of power to spacecraft leaving orbit has been considered. Power beaming by microwaves has the difficulty that, for most space applications, the required aperture sizes are very large due to diffraction limiting antenna directionality. For example, the 1978 NASA study of solar power satellites required a 1-kilometre-diameter (0.62 mi) transmitting antenna and a 10-kilometre-diameter (6.2 mi) receiving rectenna for a microwave beam at 2.45 GHz. These sizes can be somewhat decreased by using shorter wavelengths, although short wavelengths may have difficulties with atmospheric absorption and beam blockage by rain or water droplets. Because of the "thinned-array curse", it is not possible to make a narrower beam by combining the beams of several smaller satellites. For earthbound applications, a large-area 10 km diameter receiving array allows large total power levels to be used while operating at the low power density suggested for human electromagnetic exposure safety. A human safe power density of 1 mW/cm2 distributed across a 10 km diameter area corresponds to 750 megawatts total power level. This is the power level found in many modern electric power plants. Following World War II, which saw the development of high-power microwave emitters known as cavity magnetrons, the idea of using microwaves to transfer power was researched. By 1964, a miniature helicopter propelled by microwave power had been demonstrated. Japanese researcher Hidetsugu Yagi also investigated wireless energy transmission using a directional array antenna that he designed. In February 1926, Yagi and his colleague Shintaro Uda published their first paper on the tuned high-gain directional array now known as the Yagi antenna. While it did not prove to be particularly useful for power transmission, this beam antenna has been widely adopted throughout the broadcasting and wireless telecommunications industries due to its excellent performance characteristics. Under experimental conditions, microwave conversion efficiency was measured to be around 54% across one meter. A change to 24 GHz has been suggested as microwave emitters similar to LEDs have been made with very high quantum efficiencies using negative resistance, i.e., Gunn or IMPATT diodes, and this would be viable for short range links. In 2013, inventor Hatem Zeine demonstrated how wireless power transmission using phased array antennas can deliver electrical power up to 30 feet. It uses the same radio frequencies as WiFi. In 2015, researchers at the University of Washington introduced power over Wi-Fi, which trickle-charges batteries and powered battery-free cameras and temperature sensors using transmissions from Wi-Fi routers. Wi-Fi signals were shown to power battery-free temperature and camera sensors at ranges of up to 20 feet. It was also shown that Wi-Fi can be used to wirelessly trickle-charge nickel–metal hydride and lithium-ion coin-cell batteries at distances of up to 28 feet. In 2017, the Federal Communication Commission (FCC) certified the first mid-field radio frequency (RF) transmitter of wireless power. A laser beam centered on a panel of photovoltaic cells provides enough power to a lightweight model airplane for it to fly. In the case of electromagnetic radiation closer to the visible region of the spectrum (tens of micrometers to tens of nanometers), power can be transmitted by converting electricity into a laser beam that is then pointed at a photovoltaic cell. This mechanism is generally known as 'power beaming' because the power is beamed at a receiver that can convert it to electrical energy. At the receiver, special photovoltaic laser power converters which are optimized for monochromatic light conversion are applied. Collimated monochromatic wavefront propagation allows narrow beam cross-section area for transmission over large distances. As a result, there is little or no reduction in power when increasing the distance from the transmitter to the receiver. Compact size: solid state lasers fit into small products. No radio-frequency interference to existing radio communication such as Wi-Fi and cell phones. Access control: only receivers hit by the laser receive power. Laser radiation is hazardous. Without a proper safety mechanism, low power levels can blind humans and other animals. High power levels can kill through localized spot heating. Conversion between electricity and light is limited. Photovoltaic cells achieve 40%–50% efficiency. (The conversion efficiency of laser light into electricity is much higher than that of sun light into electricity). Atmospheric absorption, and absorption and scattering by clouds, fog, rain, etc., causes up to 100% losses. Laser 'powerbeaming' technology was explored in military weapons and aerospace applications. Also, it is applied for powering of various kinds of sensors in industrial environment. Lately, it is developed for powering commercial and consumer electronics. Wireless energy transfer systems using lasers for consumer space have to satisfy laser safety requirements standardized under IEC 60825. First wireless power system using lasers for consumer applications was demonstrated in 2018. It can deliver power to stationary and moving devices across the room. This wireless power system complies with safety regulations according to IEC 60825 standard. It is also approved by the US Food and Drugs Administration (FDA). Other details include propagation, and the coherence and the range limitation problem. Geoffrey Landis is one of the pioneers of solar power satellites and laser-based transfer of energy especially for space and lunar missions. The demand for safe and frequent space missions has resulted in proposals for a laser-powered space elevator. NASA's Dryden Flight Research Center demonstrated a lightweight unmanned model plane powered by a laser beam. This proof-of-concept demonstrates the feasibility of periodic recharging using the laser beam system. Scientists from Chinese Academy of Sciences developed a concept of utilizing the dual wavelength laser in wirelessly charging portable devices or UAVs, and a full-coupled model is established for the technology of laser power beaming.
) of the filament of air. This new process is being explored for use as a laser lightning rod and as a means to trigger lightning bolts from clouds for natural lightning channel studies, for artificial atmospheric propagation studies, as a substitute for conventional radio antennas, for applications associated with electric welding and machining, for diverting power from high-voltage capacitor discharges, for directed-energy weapon applications employing electrical conduction through a ground return path, and electronic jamming. In the context of wireless power, energy harvesting, also called power harvesting or energy scavenging, is the conversion of ambient energy from the environment to electric power, mainly to power small autonomous wireless electronic devices. The ambient energy may come from stray electric or magnetic fields or radio waves from nearby electrical equipment, light, thermal energy (heat), or kinetic energy such as vibration or motion of the device. Although the efficiency of conversion is usually low and the power gathered often minuscule (milliwatts or microwatts), it can be adequate to run or recharge small micropower wireless devices such as remote sensors, which are proliferating in many fields. This new technology is being developed to eliminate the need for battery replacement or charging of such wireless devices, allowing them to operate completely autonomously. The 19th century saw many developments of theories, and counter-theories on how electrical energy might be transmitted. In 1826 André-Marie Ampère found Ampère's circuital law showing that electric current produces a magnetic field. Michael Faraday described in 1831 with his law of induction the electromotive force driving a current in a conductor loop by a time-varying magnetic flux. Transmission of electrical energy without wires was observed by many inventors and experimenters, but lack of a coherent theory attributed these phenomena vaguely to electromagnetic induction. A concise explanation of these phenomena would come from the 1860s Maxwell's equations by James Clerk Maxwell, establishing a theory that unified electricity and magnetism to electromagnetism, predicting the existence of electromagnetic waves as the "wireless" carrier of electromagnetic energy. Around 1884 John Henry Poynting defined the Poynting vector and gave Poynting's theorem, which describe the flow of power across an area within electromagnetic radiation and allow for a correct analysis of wireless power transfer systems. This was followed on by Heinrich Rudolf Hertz' 1888 validation of the theory, which included the evidence for radio waves. During the same period two schemes of wireless signaling were put forward by William Henry Ward (1871) and Mahlon Loomis (1872) that were based on the erroneous belief that there was an electrified atmospheric stratum accessible at low altitude. Both inventors' patents noted this layer connected with a return path using "Earth currents"' would allow for wireless telegraphy as well as supply power for the telegraph, doing away with artificial batteries, and could also be used for lighting, heat, and motive power. A more practical demonstration of wireless transmission via conduction came in Amos Dolbear's 1879 magneto electric telephone that used ground conduction to transmit over a distance of a quarter of a mile. 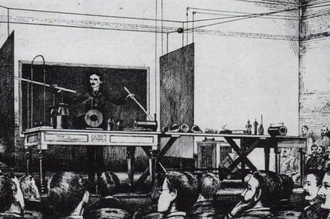 Tesla demonstrating wireless transmission by "electrostatic induction" during an 1891 lecture at Columbia College. The two metal sheets are connected to a Tesla coil oscillator, which applies high-voltage radio frequency alternating current. An oscillating electric field between the sheets ionizes the low-pressure gas in the two long Geissler tubes in his hands, causing them to glow in a manner similar to neon tubes. After 1890, inventor Nikola Tesla experimented with transmitting power by inductive and capacitive coupling using spark-excited radio frequency resonant transformers, now called Tesla coils, which generated high AC voltages. Early on he attempted to develop a wireless lighting system based on near-field inductive and capacitive coupling and conducted a series of public demonstrations where he lit Geissler tubes and even incandescent light bulbs from across a stage. He found he could increase the distance at which he could light a lamp by using a receiving LC circuit tuned to resonance with the transmitter's LC circuit. using resonant inductive coupling. Tesla failed to make a commercial product out of his findings but his resonant inductive coupling method is now widely used in electronics and is currently being applied to short-range wireless power systems. (left) Experiment in resonant inductive transfer by Tesla at Colorado Springs 1899. The coil is in resonance with Tesla's magnifying transmitter nearby, powering the light bulb at bottom. (right) Tesla's unsuccessful Wardenclyffe power station. Tesla went on to develop a wireless power distribution system that he hoped would be capable of transmitting power long distance directly into homes and factories. Early on he seemed to borrow from the ideas of Mahlon Loomis, proposing a system composed of balloons to suspend transmitting and receiving electrodes in the air above 30,000 feet (9,100 m) in altitude, where he thought the pressure would allow him to send high voltages (millions of volts) long distances. To further study the conductive nature of low pressure air he set up a test facility at high altitude in Colorado Springs during 1899. Experiments he conducted there with a large coil operating in the megavolts range, as well as observations he made of the electronic noise of lightning strikes, led him to conclude incorrectly that he could use the entire globe of the Earth to conduct electrical energy. The theory included driving alternating current pulses into the Earth at its resonant frequency from a grounded Tesla coil working against an elevated capacitance to make the potential of the Earth oscillate. Tesla thought this would allow alternating current to be received with a similar capacitive antenna tuned to resonance with it at any point on Earth with very little power loss. His observations also led him to believe a high voltage used in a coil at an elevation of a few hundred feet would "break the air stratum down", eliminating the need for miles of cable hanging on balloons to create his atmospheric return circuit. Tesla would go on the next year to propose a "World Wireless System" that was to broadcast both information and power worldwide. In 1901, at Shoreham, New York he attempted to construct a large high-voltage wireless power station, now called Wardenclyffe Tower, but by 1904 investment dried up and the facility was never completed. Inductive power transfer between nearby wire coils was the earliest wireless power technology to be developed, existing since the transformer was developed in the 1800s. Induction heating has been used since the early 1900s. With the advent of cordless devices, induction charging stands have been developed for appliances used in wet environments, like electric toothbrushes and electric razors, to eliminate the hazard of electric shock. One of the earliest proposed applications of inductive transfer was to power electric locomotives. In 1892 Maurice Hutin and Maurice Leblanc patented a wireless method of powering railroad trains using resonant coils inductively coupled to a track wire at 3 kHz. The first passive RFID (Radio Frequency Identification) technologies were invented by Mario Cardullo (1973) and Koelle et al. (1975) and by the 1990s were being used in proximity cards and contactless smartcards. The proliferation of portable wireless communication devices such as mobile phones, tablet, and laptop computers in recent decades is currently driving the development of mid-range wireless powering and charging technology to eliminate the need for these devices to be tethered to wall plugs during charging. The Wireless Power Consortium was established in 2008 to develop interoperable standards across manufacturers. Its Qi inductive power standard published in August 2009 enables high efficiency charging and powering of portable devices of up to 5 watts over distances of 4 cm (1.6 inches). The wireless device is placed on a flat charger plate (which can be embedded in table tops at cafes, for example) and power is transferred from a flat coil in the charger to a similar one in the device. In 2007, a team led by Marin Soljačić at MIT used a dual resonance transmitter with a 25 cm diameter secondary tuned to 10 MHz to transfer 60 W of power to a similar dual resonance receiver over a distance of 2 meters (6.6 ft) (eight times the transmitter coil diameter) at around 40% efficiency. Before World War II, little progress was made in wireless power transmission. Radio was developed for communication uses, but couldn't be used for power transmission since the relatively low-frequency radio waves spread out in all directions and little energy reached the receiver. In radio communication, at the receiver, an amplifier intensifies a weak signal using energy from another source. For power transmission, efficient transmission required transmitters that could generate higher-frequency microwaves, which can be focused in narrow beams towards a receiver. The development of microwave technology during World War 2, such as the klystron and magnetron tubes and parabolic antennas made radiative (far-field) methods practical for the first time, and the first long-distance wireless power transmission was achieved in the 1960s by William C. Brown. In 1964 Brown invented the rectenna which could efficiently convert microwaves to DC power, and in 1964 demonstrated it with the first wireless-powered aircraft, a model helicopter powered by microwaves beamed from the ground. A major motivation for microwave research in the 1970s and 80s was to develop a solar power satellite. Conceived in 1968 by Peter Glaser, this would harvest energy from sunlight using solar cells and beam it down to Earth as microwaves to huge rectennas, which would convert it to electrical energy on the electric power grid. In landmark 1975 experiments as technical director of a JPL/Raytheon program, Brown demonstrated long-range transmission by beaming 475 W of microwave power to a rectenna a mile away, with a microwave to DC conversion efficiency of 54%. At NASA's Jet Propulsion Laboratory he and Robert Dickinson transmitted 30 kW DC output power across 1.5 km with 2.38 GHz microwaves from a 26 m dish to a 7.3 x 3.5 m rectenna array. The incident-RF to DC conversion efficiency of the rectenna was 80%. In 1983 Japan launched MINIX (Microwave Ionosphere Nonlinear Interaction Experiment), a rocket experiment to test transmission of high power microwaves through the ionosphere. In recent years a focus of research has been the development of wireless-powered drone aircraft, which began in 1959 with the Dept. of Defense's RAMP (Raytheon Airborne Microwave Platform) project which sponsored Brown's research. In 1987 Canada's Communications Research Center developed a small prototype airplane called Stationary High Altitude Relay Platform (SHARP) to relay telecommunication data between points on earth similar to a communications satellite. Powered by a rectenna, it could fly at 13 miles (21 km) altitude and stay aloft for months. In 1992 a team at Kyoto University built a more advanced craft called MILAX (MIcrowave Lifted Airplane eXperiment). In 2003 NASA flew the first laser powered aircraft. The small model plane's motor was powered by electricity generated by photocells from a beam of infrared light from a ground-based laser, while a control system kept the laser pointed at the plane. ^ The pad senses when a phone is on it and turns on the field. The pad uses a small amount of energy when not in use, however in modern wireless systems this "off" power is very small compared to the power used when charging. Hoffman, Chris (15 September 2017). "How Does Wireless Charging Work?". How-To Geek. How-To Geek LLC. Retrieved 11 January 2018. ^ Ibrahim, F.N. ; Jamail, N.A.M. ; Othman, N.A. (2016). Development of wireless electricity transmission through resonant coupling. 4th IET Clean Energy and Technology Conference (CEAT 2016). Institution of Engineering and Technology. doi:10.1049/cp.2016.1290. ISBN 9781785612381. ^ a b c d "World's first!! Production starts for Capacitive Coupling Wireless Power Transmission Module". ECN Magazine. 27 October 2011. Retrieved 16 January 2015. ^ a b c d e f Erfani, R.; Marefat, F.; Sodagar, A. M.; Mohseni, P. (May 2017). Transcutaneous capacitive wireless power transfer (C–WPT) for biomedical implants. Proc. IEEE Int. Symp. Circuits and Systems (ISCAS), May 2017. pp. 2561–2564. doi:10.1109/ISCAS.2017.8050940. ISBN 978-1-4673-6853-7. ISSN 2379-447X. ^ a b c d e f Erfani, R.; Marefat, F.; Sodagar, A. M.; Mohseni, P. (April 2018). "Modeling and Characterization of Capacitive Elements With Tissue as Dielectric Material for Wireless Powering of Neural Implants". IEEE Trans. Neural Syst. Rehabil. Eng. 26 (5): 1093–1099. doi:10.1109/TNSRE.2018.2824281. ISSN 1534-4320. PMID 29752245. ^ a b c d e f Erfani, R.; Marefat, F.; Sodagar, A. M.; Mohseni, P. (August 2017). "Modeling and experimental validation of a capacitive link for wireless power transfer to biomedical implants". IEEE Trans. Circ. Syst.–II: Exp. Briefs, Aug. 2017. 65 (7): 923–927. doi:10.1109/TCSII.2017.2737140. ISSN 1558-3791. ^ Bush, Stephen F. (2014). Smart Grid: Communication-Enabled Intelligence for the Electric Power Grid. John Wiley & Sons. p. 118. ISBN 978-1118820230. ^ "Wireless energy transfer". Encyclopedia of terms. PC Magazine Ziff-Davis. 2014. Retrieved 15 December 2014. ^ Lu, Yan; Ki, Wing-Hung (2017). CMOS Integrated Circuit Design for Wireless Power Transfer. Springer. pp. 2–3. ISBN 978-9811026157. ^ Sun, Tianjia; Xie, Xiang; Wang, Zhihua (2013). Wireless Power Transfer for Medical Microsystems. Springer Science and Business Media. ISBN 978-1461477020. ^ a b c d e f g h Shinohara, Naoki (2014). Wireless Power Transfer via Radiowaves. John Wiley & Sons. pp. ix–xiii. ISBN 978-1118862964. ^ a b c d e f g h i j k l m Gopinath, Ashwin (August 2013). "All About Transferring Power Wirelessly" (PDF). Electronics for You E-zine: 52–56. Archived from the original (PDF) on 19 January 2015. Retrieved 16 January 2015. ^ a b Lu, X.; Wang, P.; Niyato, D.; Kim, D. I.; Han, Z. (2016). "Wireless Charging Technologies: Fundamentals, Standards, and Network Applications". IEEE Communications Surveys and Tutorials. 18 (2): 1413–1452. arXiv:1509.00940. doi:10.1109/comst.2015.2499783. ^ a b c d e f g Sun, Tianjia; Xie, Xiang; Zhihua, Wang (2013). Wireless Power Transfer for Medical Microsystems. Springer Science & Business Media. pp. 5–6. ISBN 978-1461477020. ^ a b c d e f g h i j k l m n Sazonov, Edward; Neuman, Michael R. (2014). Wearable Sensors: Fundamentals, Implementation and Applications. Elsevier. pp. 253–255. ISBN 978-0124186668. ^ Ioannis Krikidis, Stelios Timotheou, Symeon Nikolaou, Gan Zheng, Derrick Wing Kwan Ng, Robert Schober (Aug 2014), "Simultaneous Wireless Information and Power Transfer in Modern Communication Systems"
^ Arman Ahmadian, Hyuncheol Park (Jul 2018), "Maximizing Ergodic Throughput in Wireless Powered Communication Networks"
^ Suzhi Bi, Chin Keong Ho, and Rui Zhang (April 2016), "Wireless powered communication: opportunities and challenges"
^ "FCC approves first wireless 'power-at-a-distance' charging system". Engadget. Retrieved 27 March 2018. ^ a b c d e f g h i j k l m n Valtchev, Stanimir S.; Baikova, Elena N.; Jorge, Luis R. (December 2012). "Electromagnetic Field as the Wireless Transporter of Energy" (PDF). Facta Universitatis Ser. Electrical Engineering. 25 (3): 171–181. CiteSeerX 10.1.1.693.1938. doi:10.2298/FUEE1203171V. Retrieved 15 December 2014. ^ a b c d e f g h Ashley, Steven (20 November 2012). "Wireless recharging: Pulling the plug on electric cars". BBC website. British Broadcasting Corp. Retrieved 10 December 2014. ^ a b c d e f g h i j k l Tomar, Anuradha; Gupta, Sunil (July 2012). "Wireless power Transmission: Applications and Components". International Journal of Engineering Research & Technology. 1 (5). ISSN 2278-0181. Retrieved 9 November 2014. ^ Jiang, Hao; Zhang, Junmin; Lan, Di; Chao, Kevin K.; Liou, Shyshenq; Shahnasser, Hamid; Fechter, Richard; Hirose, Shinjiro; Harrison, Michael; Roy, Shuvo (2013). "A Low-Frequency Versatile Wireless Power Transfer Technology for Biomedical Implants". IEEE Transactions on Biomedical Circuits and Systems. 7 (4): 526–535. doi:10.1109/TBCAS.2012.2220763. PMID 23893211. ^ "Israeli startup turns luminaires into wireless power chargers". eeNews Europe. 15 January 2018. Retrieved 12 March 2018. ^ Coleman, Christopher (2004). An Introduction to Radio Frequency Engineerin. Cambridge University Press. pp. 1–3. ISBN 978-1139452304. ^ a b c d e Rajakaruna, Sumedha; Shahnia, Farhad; Ghosh, Arindam (2014). Plug In Electric Vehicles in Smart Grids: Integration Techniques. Springer. pp. 34–36. ISBN 978-9812872999. ^ a b c d e f g h Agbinya, Johnson I. (2012). Wireless Power Transfer. River Publishers. pp. 1–2. ISBN 978-8792329233. ^ a b c Umenei, A. E. (June 2011). "Understanding Low Frequency Non-radiative Power Transfer" (PDF). Fulton Innovation, Inc. Retrieved 3 January 2015. ^ a b Schantz, Hans G. (June 2007). A Real-Time Location System Using Near-Field Electromagnetic Ranging (PDF). 2007 IEEE Antennas and Propagation Society International Symposium, Honolulu, Hawaii, USA. Inst. of Electrical and Electronic Engineers. pp. 3792–3795. Retrieved 2 January 2015. ^ a b c d e f g h i j k Karalis, Aristeidis; Joannopoulos, J. D.; Soljačić, Marin (January 2008). "Efficient wireless non-radiative mid-range energy transfer". Annals of Physics. 323 (1): 34–48. arXiv:physics/0611063. Bibcode:2008AnPhy.323...34K. doi:10.1016/j.aop.2007.04.017. ^ a b c d e Wong, Elvin (2013). "Seminar: A Review on Technologies for Wireless Electricity". HKPC. The Hong Kong Electronic Industries Association Ltd. Retrieved 3 January 2015. ^ a b c d "Typically, an inductive coupled system can transmit roughly the diameter of the transmitter."(p. 4) "...mid-range is defined as somewhere between one and ten times the diameter of the transmitting coil."(p. 2) Baarman, David W.; Schwannecke, Joshua (December 2009). "White paper: Understanding Wireless Power" (PDF). Fulton Innovation. Archived from the original (PDF) on 9 April 2011. Retrieved 3 January 2015. ^ Smith, Glenn S. (1997). An Introduction to Classical Electromagnetic Radiation. Cambridge University Press. p. 474. ISBN 978-0521586986. ^ a b c d Tan, Yen Kheng (2013). Energy Harvesting Autonomous Sensor Systems: Design, Analysis, and Practical Implementation. CRC Press. pp. 181–182. ISBN 978-1439892732. ^ Feynman, Richard Phillips; Leighton, Robert B.; Sands, Matthew (1963). The Feynman Lectures on Physics Vol. 1: Mainly Mechanics, Radiation, and Heat. California Institute of Technology. pp. 30.6–30.7. ISBN 978-0465024933. ^ Agbinya, Johnson I. (February 2013). "Investigation of near field inductive communication system models, channels, and experiments" (PDF). Progress in Electromagnetics Research B. 49: 130. doi:10.2528/pierb12120512. Retrieved 2 January 2015. ^ Bolic, Miodrag; Simplot-Ryl, David; Stojmenovic, Ivan (2010). RFID Systems: Research Trends and Challenges. John Wiley & Sons. p. 29. ISBN 978-0470975664. ^ a b c d e f g h i j k l Davis, Sam (July 2011). "Wireless power minimizes interconnection problems" (PDF). Power Electronics Technology: 10–14. Retrieved 16 January 2015. ^ a b c d Wilson, Tracy V. (2014). "How Wireless Power Works". How Stuff Works. InfoSpace LLC. Retrieved 15 December 2014. ^ a b c d e Puers, R. (2008). Omnidirectional Inductive Powering for Biomedical Implants. Springer Science & Business Media. pp. 4–5. ISBN 978-1402090752. ^ Sun, Tianjia; Xie, Xiang; Zhihua, Wang (2013). Wireless Power Transfer for Medical Microsystems. Springer Science & Business Media. ISBN 978-1461477020. ^ a b Wheeler, L. P. (August 1943). "Tesla's contribution to high frequency". Electrical Engineering. 62 (8): 355–357. doi:10.1109/EE.1943.6435874. ISSN 0095-9197. ^ a b c d e f g h Lee, C.K. ; Zhong, W.X. ; Hui, S.Y.R. (5 September 2012). Recent Progress in Mid-Range Wireless Power Transfer (PDF). The 4th Annual IEEE Energy Conversion Congress and Exposition (ECCE 2012). Raleigh, North Carolina: Inst. of Electrical and Electronic Engineers. pp. 3819–3821. Retrieved 4 November 2014. ^ Beams, D.M. ; Nagoorkar, V. (August 2013). Design and simulation of networks for midrange wireless power transfer. 2013 IEEE 56th International Midwest Symposium on Circuits and Systems (MWSCAS). pp. 509–512. doi:10.1109/MWSCAS.2013.6674697. ISBN 978-1-4799-0066-4. ^ a b Kurs, André; Karalis, Aristeidis; Moffatt, Robert (July 2007). "Wireless Power Transfer via Strongly Coupled Magnetic Resonances" (PDF). Science. 317 (5834): 83–85. Bibcode:2007Sci...317...83K. CiteSeerX 10.1.1.418.9645. doi:10.1126/science.1143254. ISSN 1095-9203. PMID 17556549. ^ Webmaster. "Resonant Capacitive Coupling". www.wipo-wirelesspower.com. Retrieved 30 November 2018. ^ a b c d e Huschens, Markus (2012). "Various techniques for wireless charging" (PDF). EETimes-Asia. Retrieved 16 January 2015. ^ Meindl, James D. (2008). Integrated Interconnect Technologies for 3D Nanoelectronic Systems. Artech House. pp. 475–477. ISBN 978-1596932470. ^ Harakawa, Kenichi (2014). "Wireless power transmission at rotating and sliding elements by using the capacitive coupling technology" (PDF). 2014 ANSYS Electronic Simulation Expo October 9–10, 2014, Tokyo. ExH Corporation. Archived from the original (PDF) on 25 September 2015. Retrieved 5 May 2015. ^ a b Liu, Na (2010). "Coupling games in metamaterials". Retrieved 18 January 2016. ^ Camurati, Patrick; Bondar, Henri (2006). "Device for transporting energy by partial influence through a dielectric medium". Google.ch/Patents. TMMS Co. Retrieved 18 January 2016. ^ Shahan, Zach. "ELIX Wireless Rolls Out A 10kW Wireless EV Charger With 92% Efficiency". EVObsession.com. Retrieved 20 July 2015. ^ Massa, A. Massa, G. Oliveri, F. Viani, and P. Rocca; Oliveri, Giacomo; Viani, Federico; Rocca, Paolo (June 2013). "Array designs for long-distance wireless power transmission – State-of-the-art and innovative solutions". Proceedings of the IEEE. 101 (6): 1464–1481. doi:10.1109/JPROC.2013.2245491. ^ Landis, G. A. (1994). "Applications for Space Power by Laser Transmission, SPIE Optics, Electro-optics & Laser Conference, Los Angeles CA, 24–28 January 1994". Laser Power Beaming, SPIE Proceedings. Laser Power Beaming. 2121: 252–255. doi:10.1117/12.174188. ^ Landis, Geoffrey A. (7–12 May 2006). Reevaluating Satellite Solar Power Systems for Earth (PDF). IEEE 4th World Conference on Photovoltaic Energy Conversion. p. 2. Retrieved 11 May 2012. ^ "Scanning the Past: A History of Electrical Engineering from the Past, Hidetsugu Yagi". Ieee.cincinnati.fuse.net. Archived from the original on 11 June 2009. Retrieved 4 June 2009. ^ "Space Solar Energy Initiative". Space Island Group. Retrieved 4 June 2009. ^ Brown., W. C. (September 1984). "The History of Power Transmission by Radio Waves". IEEE Transactions on Microwave Theory and Techniques. 32 (Volume: 32, Issue: 9 On page(s): 1230–1242+): 1230–1242. Bibcode:1984ITMTT..32.1230B. doi:10.1109/TMTT.1984.1132833. ISSN 0018-9480. ^ POINT-TO-POINT WIRELESS POWER TRANSPORTATION IN REUNION ISLAND 48th International Astronautical Congress, Turin, Italy, 6–10 October 1997 – IAF-97-R.4.08 J. D. Lan Sun Luk, A. Celeste, P. Romanacce, L. Chane Kuang Sang, J. C. Gatina – University of La Réunion – Faculty of Science and Technology. ^ Brown, W.C.; Eves, E.E. (June 1992). "Beamed microwave power transmission and its application to space". IEEE Transactions on Microwave Theory and Techniques. 40 (6): 1239–1250. Bibcode:1992ITMTT..40.1239B. doi:10.1109/22.141357. ^ "Cota system transmits power wirelessly at up to 30 feet". newatlas.com. Retrieved 5 January 2018. ^ Etherington, Darrell. "Cota By Ossia Aims To Drive A Wireless Power Revolution And Change How We Think About Charging". TechCrunch. Retrieved 5 January 2018. ^ Talla, Vamsi; Kellogg, Bryce; Ransford, Benjamin; Naderiparizi, Saman; Gollakota, Shyamnath; Smith, Joshua R. (2015). "Powering the Next Billion Devices with Wi-Fi". arXiv:1505.06815 [cs.NI]. ^ arXiv, Emerging Technology from the. "First Demonstration of a Surveillance Camera Powered by Ordinary Wi-Fi Broadcasts". Retrieved 28 September 2016. ^ "Energous Receives Industry-First FCC Certification for Over-the-Air, Power-at-a-Distance Wireless Charging :: Energous Corporation (WATT)". Energous Corporation. Retrieved 5 January 2018. ^ Sahai., A.; Graham, David (2 June 2011). Optical wireless power transmission at long wavelengths. IEEE International Conference on Space Optical Systems and Applications (ICSOS), 2011, Santa Monica, CA. pp. 164–170. doi:10.1109/ICSOS.2011.5783662. ISBN 978-1-4244-9686-0. ^ Bett., Andreas W.; Dimroth, Frank; Lockenhoff, Rudiger; Oliva, Eduard; Schubert, Johannes (11 May 2008). III-V solar cells under monochromatic illumination. 33rd IEEE Photovoltaic Specialists Conference, 2008, San Diego, CA. pp. 1–5. doi:10.1109/pvsc.2008.4922910. ISBN 978-1-4244-1640-0. ^ Smith, David (4 January 2009). "Wireless power spells end for cables". The Observer. London. ^ "power transmission via lasers". Laserfocusworld.com. Retrieved 4 June 2009. ^ Skillings, Jonathan (23 August 2008). "Laser weapons: A distant target, CNET news August 23, 2008 1:41 pm PDT". News.cnet.com. Retrieved 4 June 2009. ^ "Laser Weapons "Almost Ready?" Not!". Defensetech.org. 12 January 2006. Retrieved 4 June 2009. ^ "White Sands testing new laser weapon system, US Army.mil, 30 Jan 2009". Army.mil. 30 January 2009. Retrieved 4 June 2009. ^ "Lasers Power Planes, Drones". Defensetech.org. 6 November 2003. Retrieved 4 June 2009. ^ "Riding a Beam of Light". Space.com. 24 October 2005. Retrieved 4 June 2009. ^ "Wi-Charge Wins CES 2018 Best of Innovation Award". Retrieved 12 March 2018. ^ "Free-Space Laser Propagation: Atmospheric Effects". Ieee.org. Retrieved 4 June 2009. Andrews, Larry C; Phillips, Ronald L (2005). L. C. Andrews and R. L. Phillips, Laser Beam Propagation through Random Media, 2nd ed. (SPIE Press, 2005). ISBN 978-0-8194-5948-0. Retrieved 4 June 2009. ^ Dr. Rüdiger Paschotta. "An explanation of Coherence". Rp-photonics.com. Retrieved 4 June 2009. ^ "An Evolutionary Path to SPS". Islandone.org. Retrieved 4 June 2009. ^ "A Supersynchronous SPS". Geoffreylandis.com. 28 August 1997. Retrieved 4 June 2009. ^ Landis, Geoffrey A. (2001). "Papers Relating to Space Photovoltaic Power, Power beaming, and Solar Power Satellites". Astrobiology. 1 (2): 161–4. Bibcode:2001AsBio...1..161L. doi:10.1089/153110701753198927. PMID 12467119. Retrieved 4 June 2009. ^ "Limitless clean energy from space". Nss.org. Retrieved 4 June 2009. ^ "Power Beaming (Climber) Competition". Spaceward.org. Archived from the original on 24 July 2009. Retrieved 4 June 2009. ^ "From Concept to Reality". The Space Elevator. Retrieved 4 June 2009. "Space Elevator Tethers Coming Closer". Crnano.typepad.com. 31 January 2009. Retrieved 4 June 2009. ^ "Dryden Flight Research Center, Beamed Laser Power For UAVs". Nasa.gov. 7 May 2008. Retrieved 4 June 2009. ^ Wu, Chen-Wu; Wang, Jyhwen; Huang, Chen-Guang (15 May 2018). "A coupled model on energy conversion in laser power beaming". Journal of Power Sources. Journal of Power Sources. 393: 211–216. doi:10.1016/j.jpowsour.2018.05.010. ^ Nawaz, Suddiyas. "Wireless Power Transmission". Academia 2015. Retrieved 31 December 2015. ^ Ray, Subir (2009). An Introduction to High Voltage Engineering. PHI Learning. pp. 19–21. ISBN 978-8120324176. ^ "Electrolaser". WiseGeek website. Conjecture Corp. 2015. Retrieved 25 October 2015. ^ Rakov, Vladimir A.; Uman, Martin A. (2003). Lightning: Physics and Effects. Cambridge Univ. Press. pp. 296–298. ISBN 978-0521035415. ^ Stahmann, J. R. (October 1964). "LASER TYPE ULTRA-VIOLET RADIATION FEASIBILITY FOR LIGHTNING AND ATMOSPHERIC PROPAGATION STUDIES". DEFENSE TECHNICAL INFORMATION CENTER OAI. LIGHTNING AND TRANSIENTS RESEARCH INST ST PAUL MN. Retrieved 16 January 2016. ^ Lawrence, Jonathan R.; Waugh, D. (2014). Laser Surface Engineering: Processes and Applications. Elsevier. pp. 456–460. ISBN 978-1782420798. ^ Forestier, B.; Houard1, A.; Revel, I.; et al. (2012). "Triggering, guiding and deviation of long air spark discharges with femtosecond laser filament". AIP Advances. 2 (1): 012151. Bibcode:2012AIPA....2a2151F. doi:10.1063/1.3690961. ^ Giulietti, Antonio; Ledingham, Kenneth (2010). Progress in Ultrafast Intense Laser Science, Vol. 5. Springer Science and Business Media. pp. 111–114. ISBN 978-3642038600. ^ Franklin, Steve (2015). Non-Lethal Weapon Handbook (PDF). Digital Services. pp. 161–162. ^ Quick, Darren (28 June 2012). "U.S. Army weapon shoots lightning bolts down laser beams". Gizmag. Gizmag Limited. Retrieved 16 January 2016. ^ Kaneshiro, Jason (21 June 2012). "Picatinny engineers set phasers to 'fry'". news Archives. US Army official website www.mil.gov. Retrieved 25 October 2015. ^ Clerici; et al. (19 June 2015). "Laser-assisted guiding of electrical discharges around objects" (PDF). Science Advances. 1 (5): e1400111. Bibcode:2015SciA....1E0111C. doi:10.1126/sciadv.1400111. PMC 4640611. PMID 26601188. Retrieved 25 October 2015. ^ a b c d Beeby, Stephen; White, Neil (2010). Energy Harvesting for Autonomous Systems. Artech House. pp. 1–2. ISBN 978-1596937192. ^ X. Kang et. al ``Full-Duplex Wireless-Powered Communication Network With Energy Causality, in IEEE Transactions on Wireless Communications, vol.14, no.10, pp.5539-5551, Oct. 2015. ^ Richard Fitzpatrick (2007). "Ampère's Circuital Law". ^ a b Angelo, Joseph A. (2009). Encyclopedia of Space and Astronomy. Infobase Publishing. pp. 292–293. ISBN 978-1438110189. ^ a b Tesla, Nikola (May 20, 1891) Experiments with Alternate Currents of Very High Frequency and Their Application to Methods of Artificial Illumination, lecture before the American Inst. of Electrical Engineers, Columbia College, New York. Reprinted as a book of the same name by. Wildside Press. 2006. ISBN 978-0809501625. ^ Leyh, G. E.; Kennan, M. D. (28 September 2008). Efficient wireless transmission of power using resonators with coupled electric fields (PDF). NAPS 2008 40th North American Power Symposium, Calgary, September 28–30, 2008. Inst. of Electrical and Electronic Engineers. pp. 1–4. doi:10.1109/NAPS.2008.5307364. ISBN 978-1-4244-4283-6. Archived from the original (PDF) on 4 March 2016. ^ Sewall, Charles Henry (1903). Wireless telegraphy: its origins, development, inventions, and apparatus. D. Van Nostrand Co. pp. 38–42. At that time I was absolutely sure that I could put up a commercial plant, if I could do nothing else but what I had done in my laboratory on Houston Street; but I had already calculated and found that I did not need great heights to apply this method. My patent says that I break down the atmosphere "at or near" the terminal. If my conducting atmosphere is 2 or 3 miles above the plant, I consider this very near the terminal as compared to the distance of my receiving terminal, which may be across the Pacific. That is simply an expression. I saw that I would be able to transmit power provided I could construct a certain apparatus -- and I have, as I will show you later. I have constructed and patented a form of apparatus which, with a moderate elevation of a few hundred feet, can break the air stratum down. ^ Tesla, Nikola (June 1900). "The Problem of Increasing Human Energy". Century Magazine. Retrieved 20 November 2014. ^ Rudnev, Valery; Loveless, Don; Cook, Raymond L (14 July 2017). Handbook of Induction Heating (Second ed.). ISBN 978-1351643764. ^ Koelle, A. R.; Depp, S. W.; Freyman, R. W. (1975). "Short-range radio-telemetry for identification, using modulated RF backscatter". Proc. IEEE. 63 (8): 1260–1261. doi:10.1109/proc.1975.9928. ^ a b Sayer, Peter (19 December 2008). "Wireless Power Consortium to Unleash Electronic Gadgets". PCWorld. Retrieved 8 December 2014. ^ "Global Qi Standard Powers Up Wireless Charging". PRNewswire. UBM plc. 2 September 2009. Retrieved 8 December 2014. ^ Leyh, G. E.; Kennan, M. D. (28 September 2008). Efficient wireless transmission of power using resonators with coupled electric fields (PDF). NAPS 2008 40th North American Power Symposium, Calgary, 28–30 September 2008. Inst. of Electrical and Electronic Engineers. pp. 1–4. doi:10.1109/NAPS.2008.5307364. ISBN 978-1-4244-4283-6. Retrieved 20 November 2014. ^ Tucker, Christopher A.; Warwick, Kevin; Holderbaum, William (2013). "A contribution to the wireless transmission of power". International Journal of Electrical Power & Energy Systems. 47: 235–242. doi:10.1016/j.ijepes.2012.10.066. ^ a b c d e f g Brown, William C. (1984). "The history of power transmission by radio waves". MTT-Trans. On Microwave Theory and Technique. 32 (9): 1230–1234. Bibcode:1984ITMTT..32.1230B. doi:10.1109/TMTT.1984.1132833. Retrieved 20 November 2014. ^ Curty, Jari-Pascal; Declercq, Michel; Dehollain, Catherine; Joehl, Norbert (2006). Design and Optimization of Passive UHF RFID Systems. Springer. p. 4. ISBN 978-0387447100. ^ Glaser, Peter E. (22 November 1968). "Power from the Sun: Its future" (PDF). Science. 162 (3856): 857–861. Bibcode:1968Sci...162..857G. doi:10.1126/science.162.3856.857. PMID 17769070. Retrieved 4 November 2014. ^ Friend, Michael; Parise, Ronald J. "Cutting the Cord: ISTF 07-1726". Mainland High School, Daytona Beach, Florida. Retrieved 7 October 2016. ^ Dickinson, Richard M. (1976). "Performance of a high-power 2.388 GHz receiving array in wireless power transmission over 1.54 km" (PDF). MTT-S Int'l Microwave Symposium Digest. 76: 139–141. doi:10.1109/mwsym.1976.1123672. Retrieved 9 November 2014.
de Rooij, Michael A. (2015). Wireless Power Handbook. Power Conversion Publications. ISBN 978-0996649216. Latest work on AirFuel Alliance class 2 and class 3 transmitters, adaptive tuning, radiated EMI, multi-mode wireless power systems, and control strategies. U.S. Patent 4,955,562, Microwave powered aircraft, John E. Martin, et al. (1990). U.S. Patent 3,933,323, Solid state solar to microwave energy converter system and apparatus, Kenneth W. Dudley, et al. (1976). U.S. Patent 3,535,543, Microwave power receiving antenna, Carroll C. Dailey (1970).